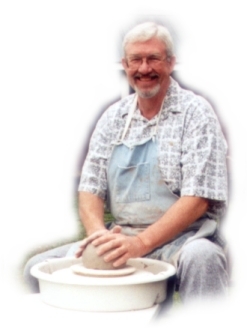 Fred makes wheel-thrown functional pottery that he and Laura then embellishes and glazes each individual piece. Laura and her mother help out by creating beautifully hand-painted pieces. All the glazes are non-toxic as well as microwave, oven and dishwasher safe. Fred uses glazes he formulates in the studio. Laura and her mother use commercial underglazes and glazes for the wonderful tiles they create.